Benign lichenoid keratosis (BLK) is a dermatologic lesion of unknown etiology that is often confused with benign cutaneous neoplasm. BLK may represent lymphocyte-mediated regression of preexisting lentigo or reticulated seborrheic keratosis. 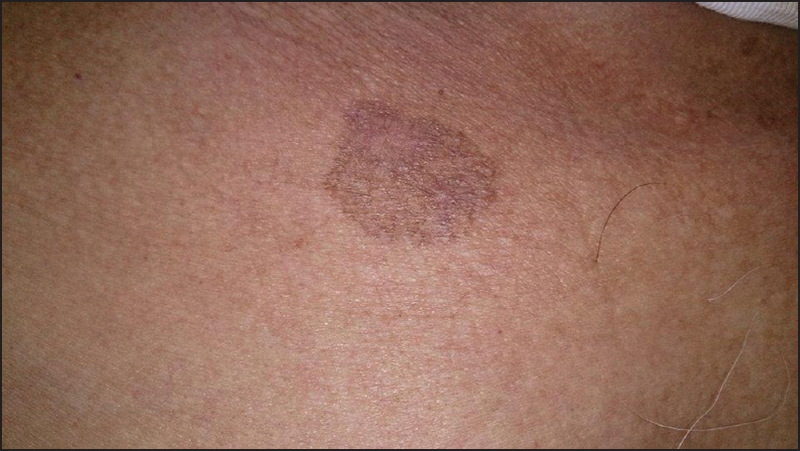 Histologically, it may show findings of lichen planus (LP). The diagnosis of this benign lesion is made by a combination of clinical features, dermatoscopy, and dermatopathology; an awareness of its presentation is therefore, necessary. Here, we report a case of a solitary lesion on the chest, the findings of which were clinically and histologically consistent with BLK. 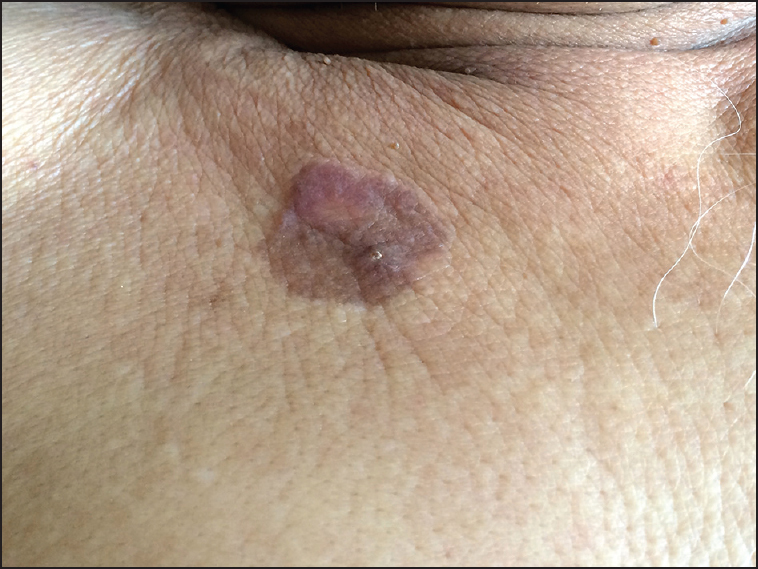 A 78-year-old man of skin type 2 presented with a single asymptomatic, persistent, raised lesion on the right side of the chest since the past 2 months. He had not received any treatment for this previously. A solitary well-defined violaceous, nontender plaque of 3 cm×4 cm size was present over the infraclavicular area [Figure 1]. It was not associated with any erosion or ulceration. The rest of the physical examination was normal. Differential diagnosis of actinic keratosis, benign lichenoid keratosis, Bowen's disease, and LP was considered. 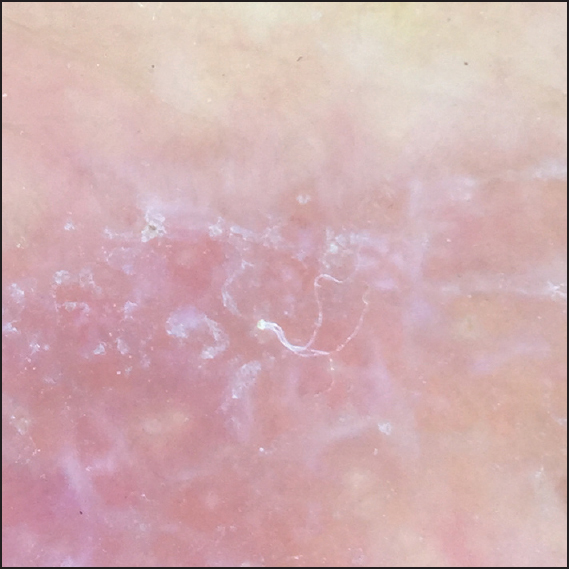 Dermatoscopy showed a reticulated pattern of bluish gray papules and lines on a background of mild erythema suggestive of BLK [Figure 2]. These were different from the dermatoscopic findings of LP that includes Wickham striae. 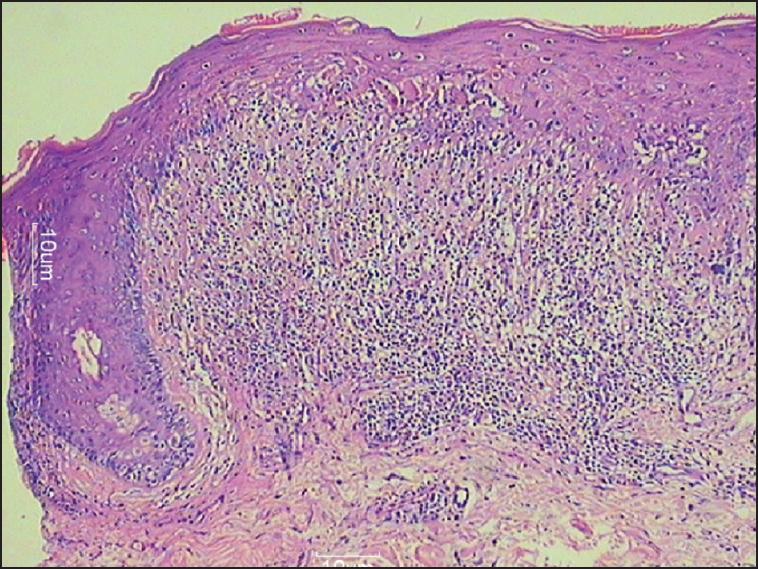 Skin biopsy showed hyperkeratosis, hypergranulosis, acanthosis, and a band-like lymphocytic infiltrate at the dermoepidermal junction with multiple colloid bodies [Figure 3], [Figure 4], [Figure 5]. Other investigations were within normal limits. The patient responded to topical 5% fluorouracil applied once a day for 2 weeks and showed a near-complete resolution [Figure 6]. Shapiro and Ackerman in 1966 described BLK as a clinicohistological entity. Lumpkin and Helwig  called it "forme fruste" of LP. Sonthalia et al. has reported a case of BLK from India in 2014. To our knowledge, ours is the second case of BLK reported from India. Clinically, BLK presents as a solitary lesion on sun-exposed sitessuch as the trunk, upper extremities, and face. It is common in fair-skinned women, between the 5 th and 7 th decade. It manifests as a rapidly evolving, mildly pruritic papule or indurated plaque of about 5-20 mm in diameter, with smooth or verrucous surface and brown or erythematous to violaceous color. Most cases of BLK regress spontaneously. Topical steroids may produce resolution of the lesion. Surgical excision may be helpful. Our review of the literature showed no specific recommendation of treatment. In our case, the patient declined surgery and was offered topical 5-fluorouracil that produced good results. Shapiro L, Ackerman AB. 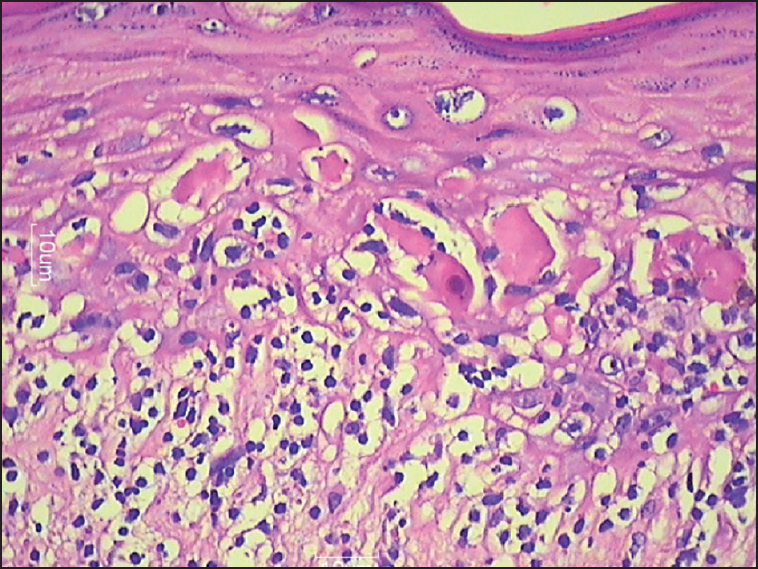 Solitary lichen planus-like keratosis. Dermatologica 1966;132:386-92. Lumpkin LR, Helwig EB. Solitary lichen planus. Arch Dermatol 1966;93:54-5. Sonathalia S, Khetan P, Sarkar R, Sharma S, Arora R. Solitary violaceous plaque over the abdomen. Indian J Dermatol 2015; 60:108. 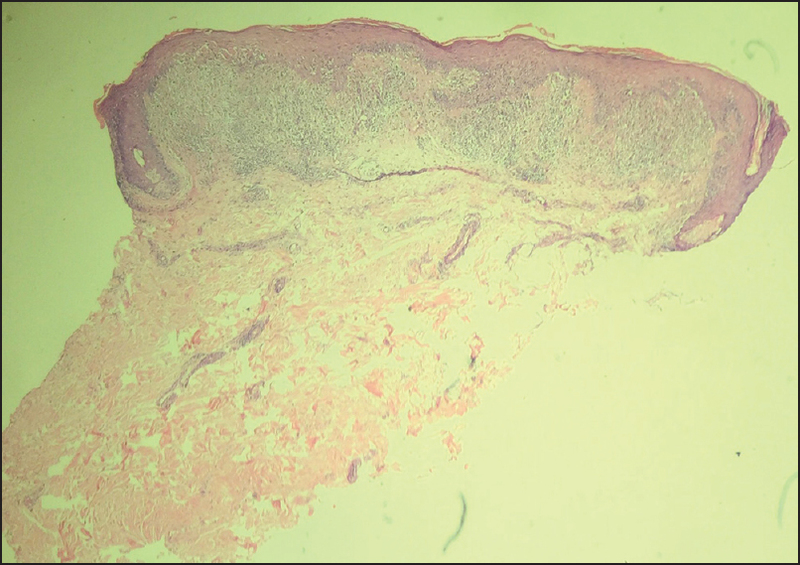 Panizzon R, Skaria A. Solitary lichenoid benign keratosis: Aclinicopathological investigation and comparison to lichen planus. Dermatologica 1990;181:284-8. Morgan MB, Stevens GL, Switlyk S. Benign lichenoid keratosis: A clinical and pathologic reappraisal of 1040 cases. Am J Dermatopathol 2005;27:387-92. Zaballos P, Martì E, Cuéllar F, Puig S, Malvehy J. Dermoscopy of lichenoid regressing seborrheic keratosis. Arch Dermatol 2006; 142:410.